1)Model NO. : 08NB3619 2)Product size:13.5 x 18.5 cm 3)Material A. Cover : PVC or PU B. inner pages : wood free paper(cream) or offset printing paper (white) 4)Interior pages : 70gsm , 60sheets 5)Content: blank pages 6)Printing: 0C/0C 7)Binding: Top-glue binding. 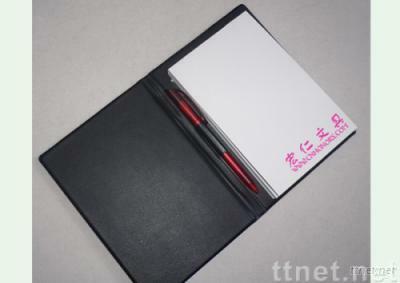 Fuax Leather Notepad with pen loop design, help you ease with your business trip or go out sketching.